I clicked on an upvote message and noticed that an old answer of mine had become “stale”, invalidated by the general progress of things. That is, since early November 2015 Microsoft is again providing the Visual C++ build tools (and SDK) without Visual Studio. Ordinary I would just have updated the answer and moved on, but I also noticed that in the three and half months that my selected-as-solution answer has provided incorrect information, two answers that provided the new and crucial information, posted to provide this information, the currently correct answer, and for nothing else, had been deleted by a moderator. This deletion has suppressed useful technical information, and it should be reconsidered and used as an example in the future. 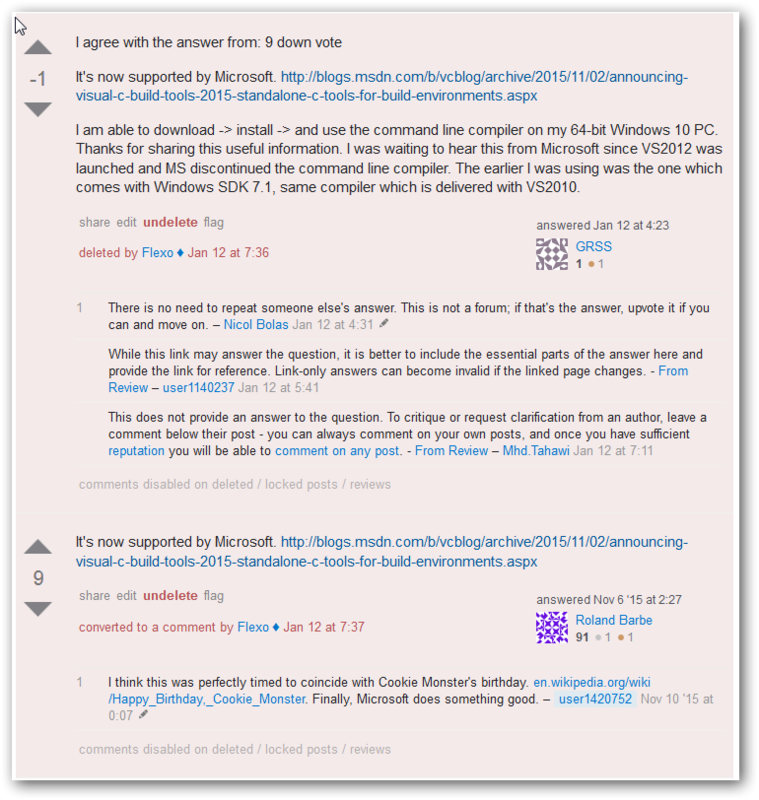 I agree with you that the answer which read "It's now supported by Microsoft." was useful and that's precisely why I converted it into a comment instead of flat out deleting. Where I don't agree with you however is that it met the current community understanding of the line between an answer and a comment. The answer which began with "I agree with the answer from: 9 down vote" clearly was a user who lacked both upvote and comment anywhere privileges looking for a way to say "thanks" like the other 9 upvoters did. In converting the older one to a comment I hoped to allow the useful update to live on until such time as someone stepped up and wrote it into a more fully featured answer. I didn't do that myself at the time because I don't think that's the right use of moderator time, it simply doesn't scale if moderators start doing all the things they see that can and should be done by the community. In converting it to a comment I hoped that someone within the community would come along later and step up, writing a complete answer which included that. This could be the person who posted the answer editing it, the owner of one of the other answers or an entirely new answer. And that's exactly what has happened here. Sure, it would be nice if the 9 upvotes on the answer made their way into being 9 comment upvotes in the conversion process, to give it prominence but that's a relatively minor feature request. Why a useful answer got deleted? Why was my useful answer deleted? Am I over-reacting with a downvote when the OP summarizes/elaborates the answer I provided?